Should Dohne ram breeders evaluate EMD and Fat ASBVs? The answer is Yes! While there may be some exceptions the answer for the vast majority is, Yes. Definition: EMD (Eye Muscle Depth). (Fat Depth). 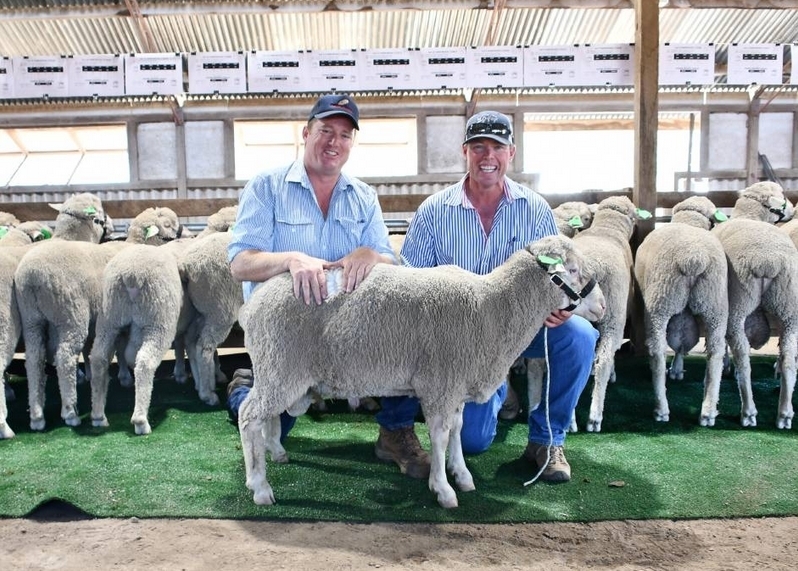 Dohne breeders have a high emphasis on breeding dual purpose sheep with a particular emphasis on breeding for prime lamb targeted at a high-end eating experience. With this emphasis Dohne breeders should aim to select for both meat quantity and quality traits, in particular EMD and Fat. The emphasis on high end prime lamb is the reason why the Dohne index aims for a significant increase in not only post weaning weight, but also muscle and fat in order to improve lean meat yield and carcase quality. In 2017 when the current Dohne index was being developed by Council they modelled a representative commercial Dohne flock. Approximately 25% of the $ improvement in economic gain predicted to be achieved by this flock was obtained by improving EMD as a result of gains in Lean Meat Yield. Also, significant direct emphasis was needed to be placed on selecting for FAT just to maintain the current fat cover let alone increase it. 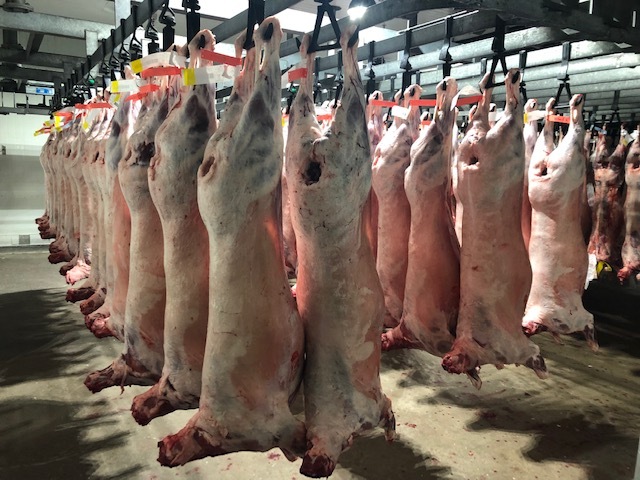 Research Indicates that selecting for higher eye muscle depth will produce lambs with greater muscling and higher yielding carcases, with a higher proportion of their carcase weight in the more valuable loin and hind quarter area of the carcase. Lambs with greater EMD are also less prone to stress and dark cutting. Many breeders feel that fat cover needs to be increased to allow lambs to be turned off with the required fat cover at a younger age if need be. Also, lambs being turned off in marginal pasture production systems need more genetic fat cover to meet high-end market specs. Whatever reason you have to select to improve EMD and Fat, and there are many good and profitable reasons to do so, you need to evaluate and measure these two traits directly and use ASBVs for EMD and Fat to assist your selection decisions. Other critical meat-eating quality traits are now available to Merino breeders via genomic evaluation. 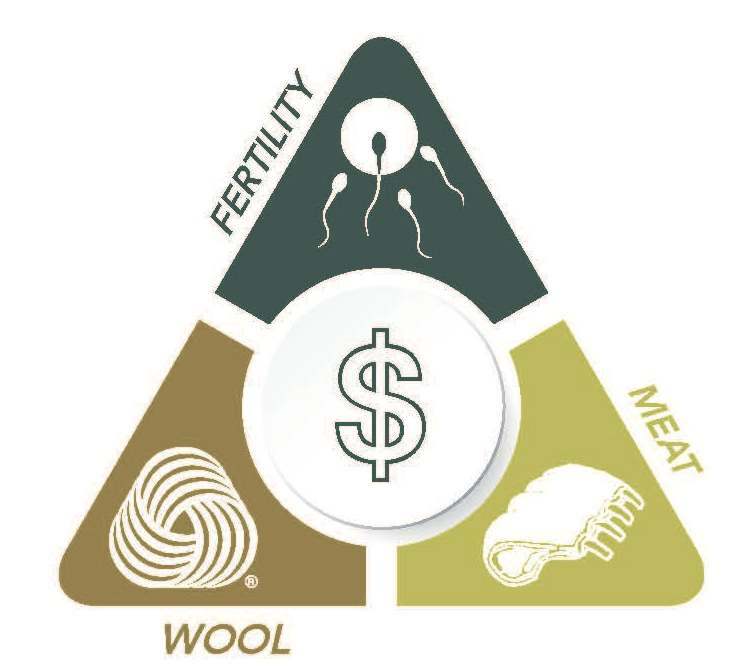 It is critical that Dohne breeders get access to these traits because the current emphasis on meat traits will over time result in poor meat-eating quality due to their antagonistic genetic relationship. 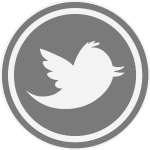 “How to collect EMD and FAT data” will be presented in the May newsletter or go to the Dohne web site now. Patrick White, Alvaholme, Narromine and Justin Tombs, Harewood Dohnes, Armidale with the $1600 top priced ram. 14 rams sold to $1900 and averaged $1150. Josh Frazer, Tableland Dohne Stud with purchaser Will McClanaghen from Armidale who purchased 3 Dohne rams at the sale. The Dohne and Dohne Cross Lamb Carcass Appraisal Day saw more than 20 sheep producers from across Victoria and New South Wales attend this event at Midfield Group in Warrnambool. The Dohne carcasses had a beautiful shape, length and width with good long bodies and were true to type, with not too much fat so no trimming was required on the carcasses. Thank you Midfield Group; Colin and Dean McKenna; who opened their doors to examine the carcasses with producers in the chiller. 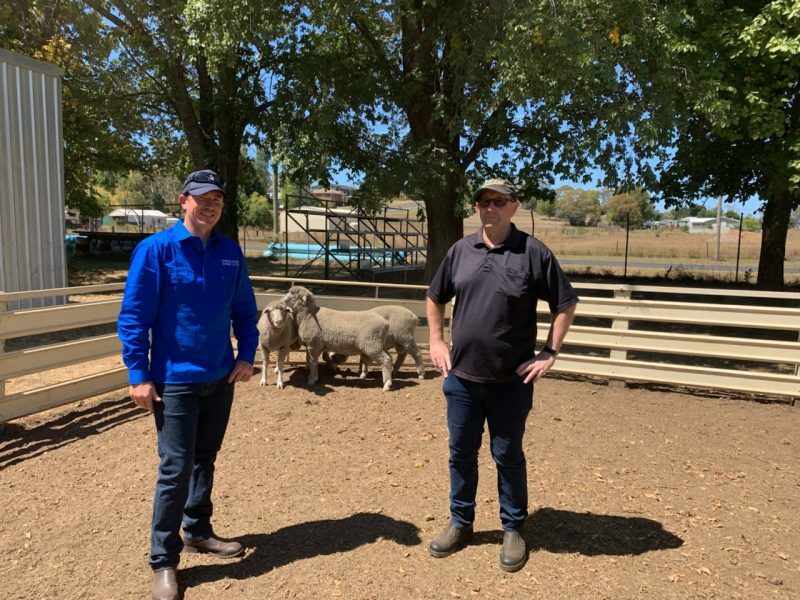 In the afternoon, producers moved to the Warrnamool showgrounds were guest speakers; Gary Simpson, from Arcadian Wool and Steve Cotton; from Dynamic Ag, gave interesting talks to producers, one of the hot topics was six-month shearing. 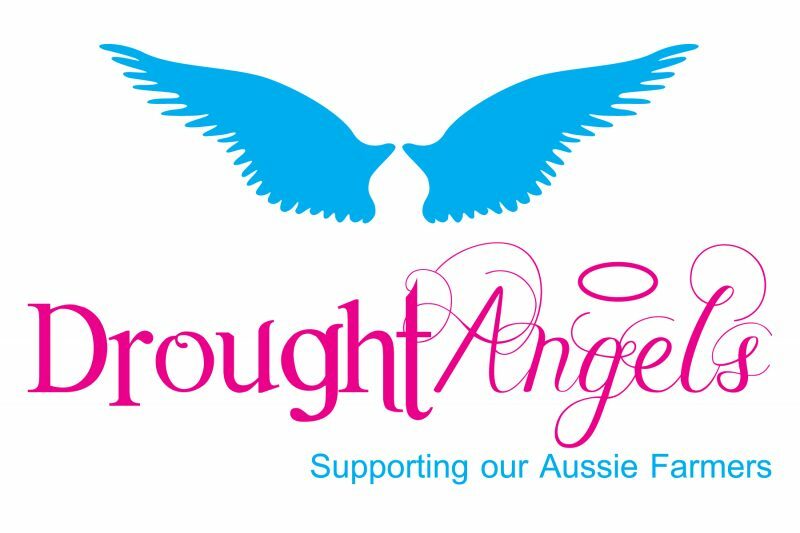 Thank you to both Gary and Steve for your support.